March Bonus - FINDING PEARL RIVER! OK, I am not a big shopper these days (have everything I need and most things I want and not much room for anything else), and I seldom just go into stores to look around, but there was this awesome Asian import emporium called Pearl River on Broadway that I used to love - it just had all kinds of stuffs. Mostly I would buy food there, tea and cookies and Botan Rice Candy (this is a kid-from-Hawaii thing, has this rice paper wrapper that melts in your mouth) and I think once they had Noh of Hawaii haupia mix (and I bought like their entire stock); I do also have a sake set from there, and some chopsticks, and sandalwood soap, and a few other odds and ends, and then there was one time that I had a very special art project and needed some things to finish it, I wasn't sure exactly what things, but I was pretty sure that if I just went to Pearl River and walked around looking at things for a while, I would find whatever it was and I did. That was just the kind of store it was. They closed last year after 12 years in the same location after getting hit with a huge rent hike. I was so upset I answered a "What would be the best way to improve SoHo" question in a SoHo Business Improvement District questionnaire that Scholastic employees got to take with "SAVE PEARL RIVER!" No use of course, they just couldn't cover a SoHo rent selling five dollar tchotchkes and forty dollar scarves, no matter how cute or pretty, so they shut down and just did online retail for a while (check 'um out at pearlriver.com). Sometime recently, I was delighted to hear that they'd found a new place in Tribeca. I hadn't had a chance to go check it out yet and I wasn't thinking of it at all but I'd run into my friend & neighbor Gail at the march, and neither of us wanted to stick around in Foley Square for too long after we got there (I would've had a late night the night before anyways after going to my first ceili in fifteen years in Long Island City, and then when I got home I found out about my friend passing away and then I just couldn't get to sleep), so we decided to walk over to Broadway and then up to the Q train at Canal Street, and that's how we stumbled across Pearl River's new location at 359 Broadway! We had a great time looking around; I didn't have any cash on me so I just looked, but I'm going back for some goodies SOON! Starting at Battery Park (appropriately within view of the Statue of Liberty, right by the Immigrants Memorial, and across the street from the Smithsonian's Museum of the American Indian) and travelling up to the US Courthouse at Foley Square. The new ban is un-American by my way of thinking, and I'm grateful to have had the chance to march with fellow New Yorkers of all types to say so. And I marched today in honor of a wonderful FB friend who passed away very unexpectedly a day or two ago - she was one of the founders and moderators of the Facebook group Church of the Double-Bladed Paddle, (FB membership required to view) and we'd had enough conversations for her to be squarely in that group of FB friends who I genuinely would have loved to meet someday. I think she had that effect on a lot of people - she was so genuine and warm in her love of the sport. A lot of the "parishioners" went out paddling in her honor today; I had at one point (before the news broke) had thoughts of paddling today, but then I found out about today's rally and decided to do that instead. The FB group is apolitical, it's just about sharing the joy and peace and beauty that people all over the world find on the water, but on her own wall, Cat had been following the various protests with enthusiasm up until the end. As I looked out at the shining water of NY Harbor when I first got to Battery Park, I thought "This one's for you, Cat". I think she would've liked that. Can't believe she's gone. It was a good day, an estimated 10,000 people turned out. That's it for the writeup, click on any photo for a slideshow. Basically lifted from Facebook - Finally saw Moana last night after a couple of reschedules, I'm not sure I'll have time for an in-depth review (plus reviews are not exactly my specialty) but I enjoyed it very much and after I got home, I stayed up WAY too late watching this "behind the scenes" thing - I'm just fascinated by the process of making animated movies and it's so much fun watching actors doing the voices, and I love watching the artists at work too. It's 20 minutes long and well worth the time if you like this sort of thing. 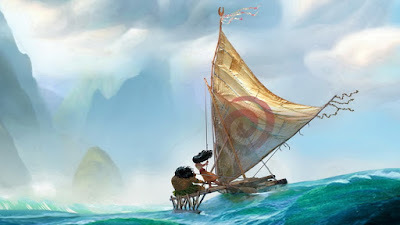 There was a lot of objection among Pacific Islanders to how Maui was depicted and I do think they could've made him look more like The Rock and less like a fireplug (my sister and I grew up with Maui stories in Hawai'i, and we agreed that that wasn't how we'd pictured him at all), but it's a fun character in a fun and frequently beautiful movie -- the sailing canoe scenes and some other things that I don't want to talk about "'cause spoilers" 😉😉 gave me chicken skin! Good fun, so glad I finally got to see it, and glad to see it on the big screen. BTW, I haven't done a Hōkūleʻa update in a long time, but she and her remarkable crew recently travelled through the Panama Canal and are now safely back in her home waters of the Pacific, where their first stop is the Galapagos Islands, where they are today. Follow these remarkable real-life wayfinders as they voyage back to Honolulu at Hokulea.com. You can also see my posts from Hōkūleʻa's visit to NYC by clicking the "Hokule'a NYC" tag below. It was an honor and an ispiration to join the gang at Hālāwai to welcome her to our city. What a sight that was to see! Yesterday TQ and I joined up with a bunch of paddling friends for the Women's March in NYC. He and I never actually got to march, the number of people that turned out exceeded expectations and it took more time to get things moving than we had (lost a friend in December and his memorial service was yesterday, wouldn't have missed that for anything and I'm very glad we went), but we can at least say that we took a stand! Amazing day in NYC, powerful and peaceful. Thank you Mary for putting this together, and to Melinda Beck for permission to use her artwork as a sign (she's an amazing graphic designer and this was for a recent editorial by John Kerry in the NY Times - she shared it on Facebook and I loved it), and to everyone out there who marched yesterday. What a day. Here's a bunch of pictures - no more writing, click on the first picture for a slideshow view. Well, that was fun! Last week, I actually got to help organize a paddle that ended up being much more of an adventure than anything I've done lately - somehow, with the one exception of helping out with swim support for the CIBBOWS Breezy Point 5K, I don't think I did any paddles in 2016 that didn't start and finish at the club. I really don't mind this, I love being out on Jamaica Bay all through the year, watching the seasons change and the various creatures that inhabit the bay come and go through the year, and I did have a couple of particularly memorable paddles (there was my solo paddle to see the Hokule'a when she first arrived in NYC, and my Coney Island Fireworks paddle, and then there was a pretty awesome storm paddle), and, well, it's a fact that no two paddles are ever the same. Appropriate quote, from Greek philosopher Heraclitus: ""No man ever steps in the same river twice, for it's not the same river and he's not the same man." I think I've heard this paraphrased among paddlers as "You never paddle the same river twice" and I do think that's true. Anyways, for all that, I guess I was really ready to do something new and different and fun, because when I was put in touch with Dewey from the North Brooklyn Boat Club, who was looking for information about paddling to Swinburne and Hoffman Islands to see the seals who frequent that area in the wintertime, I said something to the effect of "I'd be tempted to ask if Sebago could come but I don't want to horn in on your plans", and when he said "Actually we'd love to have you along! ", all it took was a really nice weather forecast, and TQ saying it sounded like fun when I ran it past him, to have me gleefully jumping in to help organize a Sebago contingent. This is not a paddle I had ever done, although I've been hearing about people going out there for sealwatching for years now. I've gone to see the seals there, but on one of the Audubon/Water Taxi trips, which was lots of fun, trip report here, never in my own boat. BTW I will give links at the end for three count 'em three very good ways for folks who aren't winter paddlers to get a good look at the seals. Sebago does seal paddles, but usually at Jones Beach (we've also done seal hikes there, which are great because anyone at the club can do that); I think we have gone to Swinburne once or twice, probably launching from Staten Island (makes for a very short paddle, but some of our Jones Beach paddles have been pretty low mileage too) but for one reason or another I wasn't able to join in. So I was absolutely delighted to be included. I was able to get good launch info for Kaiser Park in Coney Island from one of my friends among the polar bears (thanks Eddie! ), Dewey picked that over the shorter Staten Island launch option, and with the weather forecast getting better every day (light light wind, temperature right around freezing, and a chance of snow, snow paddles are great! ), I sent out a trip notice on the Sebago google group. Saturday afternoon, six of us from Sebago met up with 8 paddlers from NBBC, and it ended up just being an amazing day. There are a few photos from the day below (including our short visit to the Yellow Submarine of Coney Island Creek), and I've done a whole photo trip report on Flickr (with captions and everything, for once). It was quite the day out there, I'm so glad NBBC invited us along! Audubon Winter Tours with NY Water Taxi - departs from South Street Seaport in Manhattan, every Sunday except 2/5, until spring. This is the one I went on with a bunch of friends from Sebago, and we had a great time. American Princess - I haven't been sealwatching with them, but their whalewatching trips with Gotham Whale are fantastic and I'm sure they do a great job in the wintertime too. Out of Riis Landing on the Rockaway Peninsula; on hiatus right now, resuming on weekend in mid-March. And, if you are game for a little more of an adventure, I think that a sealwatching trip on the NY Media Boat would be just amazing. Bjoern and Kristina are great people and they can zoom you all over NY Harbor in their big speedy RIB's. They're a little more weather-sensitive this time of year, not having a heated cabin (hey, I said adventure! ), so there's no online booking, but they've got contact info up their site and welcome inquiries.